Founded in 2010, elle cuisine is a full-service food and event management company that offers interactive and personalized culinary experiences. From intimate private cooking classes and multi-course tasting menus to large scale corporate affairs and weddings, elle cuisine’s mission is to serve the finest food and create engaging atmospheres in which moments are shared and relationships flourish. Lauren Mozer is the founder, executive chef, and CEO of elle cuisine. Lauren attended McGill University where she completed her undergraduate degree followed by George Brown College, where she graduated, with honours, from the Culinary Management Program. At 23, while still full-time at GBC, Lauren founded elle cuisine, with an initial focus on private chef services. In the past 7 years, the company has quickly grown into a mid-sized business, employing over 30 people full time, and hundreds of others via casual contracts (event staff), while satisfying thousands of clients. 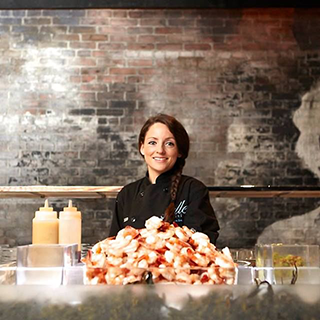 With a current focus on full-service event management and catering, Lauren’s passion for offering top quality interactive and personalized culinary experiences is at the core of elle’s values.